The University of Warwick is one of the most respected higher education institutions in the United Kingdom. It was founded in 1965 and since inception it has never been outside the top 10 in university rankings. Currently it is ranked the 6th best research institution in the UK and is in the prestigious Russell Group of universities. Famous for its commercial approach and close links with the business community, the university is also home to WMG , the International Automotive Research Centre and Warwick Business School (one of the top 3 business schools in the UK). We have forged close ties with companies such as Ford, Jaguar, Land Rover and Tata. Warwick Racing is a final year undergraduate project which involves designing, building and marketing a single seater racing car in a multidisciplinary team to take part in a worldwide competition. It is widely recognised by institutions and businesses alike as one of the best ways to develop the soft skills required by many companies today. The project has been running at the School of Engineering for the last 9 years under the name Warwick Formula Student, and in this short space of time we have already managed to pick up several prizes at the Formula Student competition. We have improved our car every single year and in 2010/2011, we aim to be one of the top 5 universities in the UK at the competion. Warwick Racing is the highest profile undergraduate project at the School of Engineering, and arguably the entire University of Warwick. 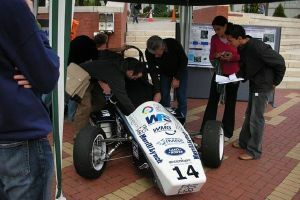 Our car is regularly exhibited in our bustling campus of 16,000 students and certainly draws the crowds! Sponsoring our team would open up superb advertising and recruitment opportunities due to our appeal to students and our access to the School of Engineering. The talented pool of undergraduates at the School of Engineering pursue a very wide range of careers after graduation, from financial services to automotive design, therefore the recruitment opportunities here are obvious. On top of this your company logo will be displayed on our award winning website which receives hits from all over the world. Please click here to view the general sponsorship packs that we have on offer. These would be tailored to sponsors' individual needs.